Ryan Baker and Andrew Schofield have done it before, building BookIt and then selling it to Trade Me in 2010. It’s 2013, and the pair were still spending time at Trade Me up until a few months ago, but were also working on a new company – Timely. Timely is an online service for companies who run appointment based businesses. Their website is a homage to doing everything right for cloud based businesses selling to small business. I’ve been watching progress for a while, and today it was great news for Timely that they have attracted a round of funding from Rowan Simpson. Rowan was the logical first investor, as he has not only been part of both Trade Me and Xero, but was also a first investor in and a key part of the growth of Vend. Rowan has a knack of not just picking winners but also of being picked by winners, as all of these companies are on lovely growth curves. Despite the continued growth, Timely is still at an early stage, and will now need to build out customer service, product development and sales teams and performance. Their job is to prove that the next round of investment, which should be over $1 million, will almost certainly get more growth and returns. Unlike when Trade Me and Xero began, but like Vend, they are in a competitive market, and sowill need to carve out a global niche for themselves. Overal I seea very strong chance of success and wish them well. Vend is a bit further ahead, and their job is right now focussed on building their team from 40 to 120 so that they can expand, build the product features and serve customers. They are recruiting for a new office in Toronto and recently opened one in Melbourne. 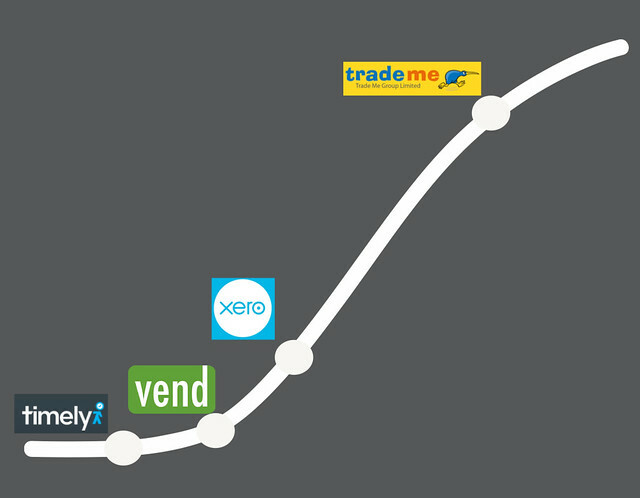 Xero, like Timely and Vend, is addressing an enormous global market. Their job is the same as Vend’s, to run as fast as they can while building out their sales, support and product development and operations capabilities and results. They are looking for hundreds of people at the moment, and the key for them (and Vend) is to keep the culture consistent as they grow. Trade Me is the aging rockstar of the group, and sadly for them addresses only the domestic market with their core product. Their challenge is to find the next wave of products that will allow them to get back on to a larger growth curve – say one aimed at the rest of the world. They need to do that while also making sure they stay ahead of the pack in New Zealand. Their website used to set usability standards, but now their products seem a bit dated, if still dominant. They have significant opportunities if they can grab them, and being unleashed by the IPO seems to be helping.